October 2, 2011 — Googling “remote-controlled hand” yields tons of fascinating information about the amazing advances that medical science and engineering are accomplishing in the area of prosthetics, where we’re almost to the point that it’s better to have prostheses instead of our original biological parts. Of course, this article isn’t about anything so noble. It’s about a Halloween toy. On September 29, far enough from Halloween proper that we hadn’t even loaded up our advent calendar yet, I walked into Costco to see two large, prominent rows filled to bursting with the magic, er, merchandise of Christmas…lighted trees, ornaments, wrapping paper, snowmen and reindeer lawn decorations, evergreen wreaths and LED icicles. Adding snow to the wound, Costco had pushed into a backend corner of one of those Yule-tide rows a small stack of Halloween items that consisted entirely of a palette of candy bowls and a palette of remote control severed hands. That’s it. Halloween over before it had begun. 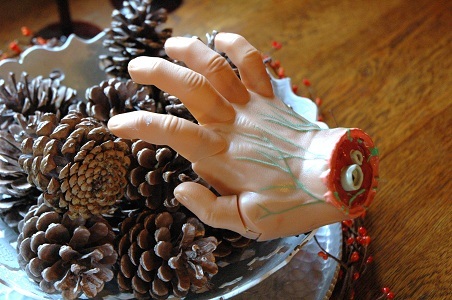 So, as an act of defiance against the Christmas creep, I bought one of the hands, which at a mere $15 made it a pretty easy decision. A hand in the hand is worth $15 in the bush. 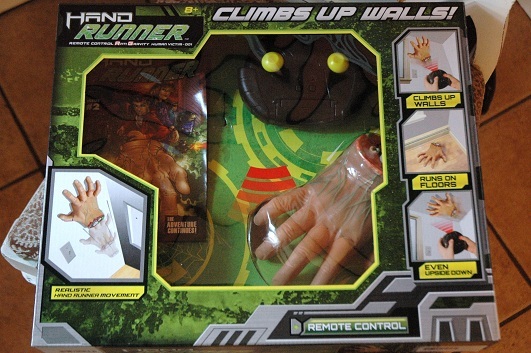 Called a Hand Runner and put out by a company called Fantasma Toys, it’s part of a line of so-called Anti-Gravity Runners that also includes a tarantula and a black widow. I honestly wasn’t expecting much. After all, this patent-pending China-made hand doesn’t look too life-like (or death-like, considering it ends in a red stump punctured by shafts of broken white bone), but one phrase on the box in particular caught my attention, “Climbs up Walls!” Also implied on the box, although not as directly, was that it also climbs across ceilings. You don’t have to have seen Trainspotting to realize the vast, unholy potential of such a thing to terrify. 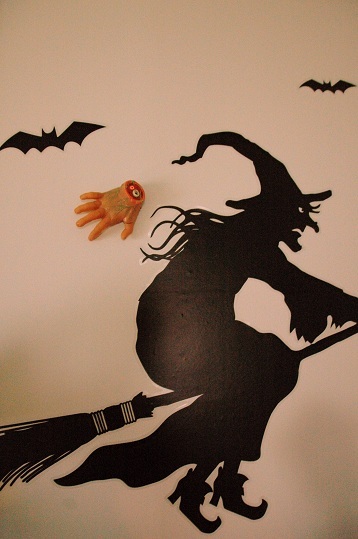 Of course, before I could unleash it onto the Halloween-decorated walls of my house, I had to buy six AA batteries, and then charge the hand on the combo remote control/charging pad. 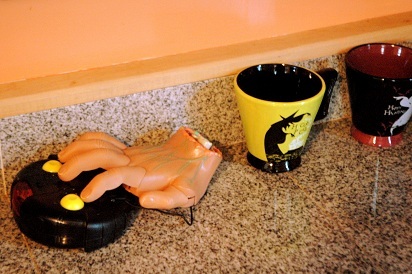 A charging severed hand is the third weirdest things I’ve ever laid on my kitchen counter. The hand is lighter than it looks, which makes sense considering it’s supposed to defy gravity, with moving fingers and a respectable level of detail, somewhere between laughably cheap and haunted house attraction set décor (although if it were the last chosen for kickball, it would end up on the former’s team, of course). Those details include green veins, knuckle wrinkles, and even a thin line of white at the distal edge of each fingernail. It’s about the size of my own adult male hand (but larger than my own child female hand), and comes with a confusing mini-comic about an army of intelligent alien spiders and the reanimated severed hand of a corpse attacking some kind of paranormal para-military base. I’m a bit too jaded to be an impartial judge on these matters, but according to the tears of my two-year-old, the thing is pretty freaky. I think I actually get that, though. 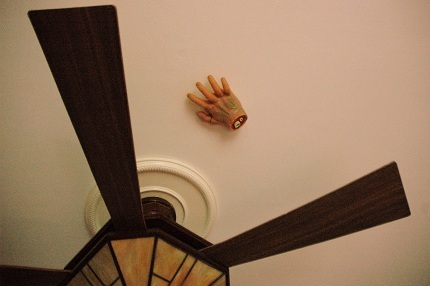 It moves way faster than I was expecting, each finger moving violently up and down in a blurry, crawling sort of motion, and it’s also extremely loud, both when it’s running on the floor and especially when you flip on the small vacuum that suctions it to walls and ceilings. Because it really does creep across walls and ceilings. That $15 couldn’t have gotten me a better return in a high-yield bank CD. Back to the fear factor, this isn’t the type of severed hand that creeps up on when you’re not looking. It’s the type that runs full bore at you, motor screaming and fingers wagging rapidly, flick-starting your flight-or-stomp-on-it-till-its-dead reflex. Unless you have even a thin carpet on your floor, in which case, the thing will just whirr sadly without moving. However, because of its speed on smooth surfaces, be they floor, wall, or ceiling, it takes a little bit to learn how to control it. Part of that is also because I have a habit of picking up the controller upside down without realizing it until I’m done playing with the hand, but I’m dumb. You’ll fare better. Another part of that is also because you can’t believe it’s not going to fall off the wall any second (which it only has for me so far when I ran it full-speed into a picture frame, as well as off the side of a doorway). Fortunately, those were both soft landings thanks to chair cushions and randomly placed pillows. All the fingers popped off both times, but it seems they’re made to do that to decrease the chance of breakage. They popped right back on easily. Still, I can definitely envision the hand breaking if it were to fall from ceiling to a hardwood floor below, but so far (my own fingers crossed), that hasn’t happened. Nor do I want it to. Because I really like it. Sorry, baby. Eventually your terror will deaden your soul and you’ll be fine. Or at least less demanding of attention. Update: As you saw, during the course of shooting that footage, the hand did, in fact drop from ceiling to hardwood floor. The body got dinged up a bit, but it’s still able-bodied…if that's ever a descriptor you can use on a severed hand. However, it certainly won’t survive too many of those types of falls. To avoid smashing the thing, you need to keep it at full charge to ensure that it clings to vertical services or upside-down. Of course, full charge only lasts for a few minutes. That’s easy to put up with, though. It’s a remote-controlled severed hand, after all.